Karnataka election results 2018: Siddaramaiah and HD Kumaraswamy met at Governor's House in Bengaluru. 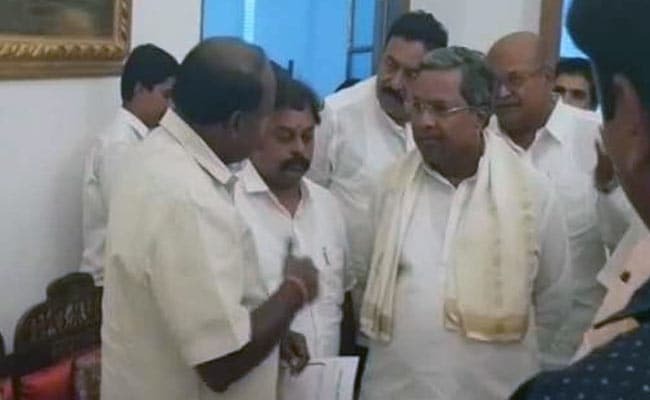 Bengaluru: At the Governor's House today, Congress's Siddaramaiah was seen with the man who hopes to replace him -- HD Kumaraswamy of Janata Dal Secular. The two men met as the Congress and its new ally JD(S) went to stake claim to form government. Barely an hour before, Mr Siddaramaiah had formally stepped down from the Chief Minister's post, which would go to Mr Kumaraswamy if the Governor invites them to form government. Standing in one of the opulent rooms, the two men were seen greeting each other formally. Later, they were seen seated, waiting for the Governor's summons, separated by senior Congress leader Ghulam Nabi Azad and a vacant chair. There was no eye contact. Mr Kumaraswamy's elevation in the JD(S) was the reason for Mr Siddaramaiah's acrimonious exit from the party. It is common knowledge that party chief HD Deve Gowda is yet to forgive him for that. Over the last few days, as exit polls predicted a split verdict, the JD(S) made it clear that if the Congress wanted to form an alliance, it had to take the first step. Mr Kumaraswamy went on record saying he prefers to be king and not kingmaker. That the Congress camp was considering the issue became clear as Mr Siddaramaiah remarked that he had no objection stepping aside if the party wished to have a Dalit candidate. But there was a rider: "Even the MLAs also have to give their opinion". Today, senior JD(S) leaders indicated that back-channel discussions between the two parties were on. But the final decision to give up the Chief Minister's post and support a JD(S)-led government was taken at a family council this noon at Congress chief Rahul Gandhi's Delhi residence. His mother Sonia Gandhi, who led the party for nearly two decades, and sister Priyanka Gandhi Vadra were present, sources told NDTV. Sources said the decision to give up the Chief Minister's post and support the regional party, which was expected win around 40 seats - half that of Congress - was a strategic one. It was meant to show that the Congress can go to any extent to keep the BJP out - a clear message ahead of the 2019 general election.